'Fruit Cocktail' (Keith Keppel, R. 1996). Seedling #92-19A. IB, height 23" (58 cm), Midseason bloom. Standards marguerite yellow (M&P 10-C-1), flushed vanilla (10-C-3) in center, light primrose yellow (10-J-4) suffusion and veining, darker chinese yellow (10-K-6) base; style arms marguerite yellow flushed primrose yellow; falls yellow ochre (11-L-7) wash over most, remainder marguerite, brushed primrose yellow to light chrome yellow (10-L-4) at edge; beards solid intense fire red (1-F-12); slight sweet fragrance. 'Florida Orange' X 'Orange Tiger'. Keppel 1997. Honorable Mention 1999. 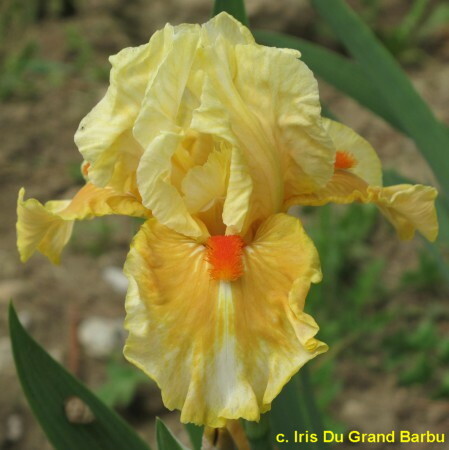 From AIS Bulletin #305 April 1997 Introducing FRUIT COCKTAIL (Keppel) IB, M 23" (Florida Orange X Orange Tiger) Soft yellow, peach and apricot ochre blended bitone, fire red beards. #92- 19A. $15.00. Keith Keppel. jpg P1500110-X2_fruit_cocktail.jpg manage 286 K 17 Feb 2016 - 06:26 BrockHeilman Please contact Brock Heilman for image use.